Politburo member and permanent member of the Communist Party of Vietnam (CPV) Central Committee’s Secretariat Tran Quoc Vuong has stated that the Vietnamese Party, State, and people always treasure their traditional friendship with the Mongolian People’s Party (MPP), the State and people of Mongolia. Deputy Prime Minister Truong Hoa Binh received Mongolian Minister of Justice and Home Affairs Tsend Nyamdorj, who is on a working visit to Vietnam, in Hanoi on October 15. A delegation from the Khural of People’s Deputies of Mongolia’s Töv province led by its head TS. Enkhbat paid a working visit to the northern mountainous province of Hoa Binh on October 5. The Olympic Council of Asia (OCA) has cancelled the result of Mongolian wrestler Orkhon Purevdorj in the women’s 62kg category of the freshly-concluded Asian Games 2018 (ASIAD) in Indonesia due to testing positive to doping. Deputy Foreign Minister Le Hoai Trung hosted a reception for State Secretary of the Ministry of Foreign Affairs of Mongolia Davaasuren Damdinsuren in Hanoi on May 18. Vietnam and Mongolia should further intensify partnership through the exchange of visits at all levels, cooperation in personnel training and experience sharing in UN peacekeeping mission. Defence Minister Ngo Xuan Lich noted the growth in Vietnam – Mongolia defence cooperation, which has yet to meet its potential, at a meeting with Mongolian Ambassador to Vietnam Dash Bilegdorj. 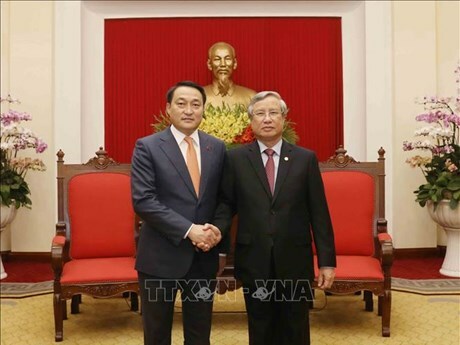 Chairman of the Mongolian Parliament Miyegombo Enkhbold on January 23 wrapped his four-day official visit to Vietnam at the invitation of Chairwoman of the National Assembly Nguyen Thi Kim Ngan. General Secretary of the Communist Party of Vietnam Nguyen Phu Trong has suggested Vietnam and Mongolia to further foster the traditional friendship between the Communist Party of Vietnam and the Mongolian People’s Party, towards deepening the bilateral relations. The Government and people of Vietnam will make greater efforts to accelerate the cooperation with the Government, parliament and people of Mongolia, said Prime Minister Nguyen Xuan Phuc. The Vietnam-Mongolia traditional friendly and cooperative relations have been developed ceaselessly, but potential for trade and investment cooperation is not fully tapped. Chairman of the Parliament of Mongolia Miyegombo Enkhbold and his spouse have arrived in Hanoi for an official visit to Vietnam from January 20 to 23. Chairman of the Parliament of Mongolia Miyegombo Enkhbold and his spouse will pay an official visit to Vietnam from January 20 to 23. Mongolian Ambassador to Vietnam D.Bilegdorj said he will do his utmost to promote the traditional friendship between the two countries at a meeting with Deputy Prime Minister and Foreign Minister Pham Binh Minh in Hanoi on November 16.